Posted by cath in cakes and treats, comfort food, easy, Recipes, variations. Quick and easy, the secret seems to be: don’t try too hard! Instead of rolling the dough, just pat down with cool hands. Also, don’t cut them too thin, 2 cm or a bit thicker is best. Pre-heat the oven to 200 degC, grease a baking sheet. Sieve the flour, salt and baking powder into a bowl. Cut the cold butter into cubes and either rub in by hand or process very quickly. Now add the sugar and mix briefly again. Add about half the beaten egg and process again adding the milk pouring it in slowly, or do this using a knife mixing until a sticky dough is formed. In the processor, keep going until a ball is formed. You should have a splash of milk leftover. By hand a little kneading in the bowl helps, but don’t handle the dough to much and keep those hands cool! Lightly flour a board, using s-r flour again. Don’t use too much extra flour, you won’t need it. Turn out the dough ball and quickly flatten it to about 2 cm thick, no thinner! Cut using a 6 cm round, press down evenly and then remove the excess dough from around the first scones. You need to very quickly press the dough back into a ball and push down again. Repeat until its all cut. Place cut scones on the baking sheet. Add any remaining milk to the beaten egg leftover, mix and brush onto the top of the scones. Bake in the oven for 8-10 minutes until golden and hollow when tapped on the base. Remove and place on a rack to cool, best served warm. This makes a basic, white, plain scone, perfect for cream tea…but anything can be added before mixing to a dough, so experiment away with savory and sweet additions. My favourite has to be cheese, a strong grated cheddar is good… and although you can add as much as you want, for this quantity about 50g of cheese/ dried fruit/ nuts etc. should be about right. I’ve been eating my scones with raspberry jam and clotted cream – yum, and perfect with a nice cup of tea. Hope you enjoy making scones of all sorts. Posted by cath in cakes and treats, comfort food, easy, Recipes. These are basic sponge cakes, and the best thing is that you can use pretty much any flavouring you like – it’s a really versatile recipe. Anyone can make these simple little cakes, they are easy and quick. The basic recipe here makes 12 cakes – but can be scaled up as required. In fact, the basic mix can also be divided and flavoured in different ways to bake a selection of cakes. You will need small paper cases to bake them in. I use a food processor to make the mix, it’s done in a few simple steps and does not take long. They are made by the creaming method which involves beating butter and sugar together and incorporating lots of air, similarly with the eggs. Sieved self-raising flour is then added along with flavouring. 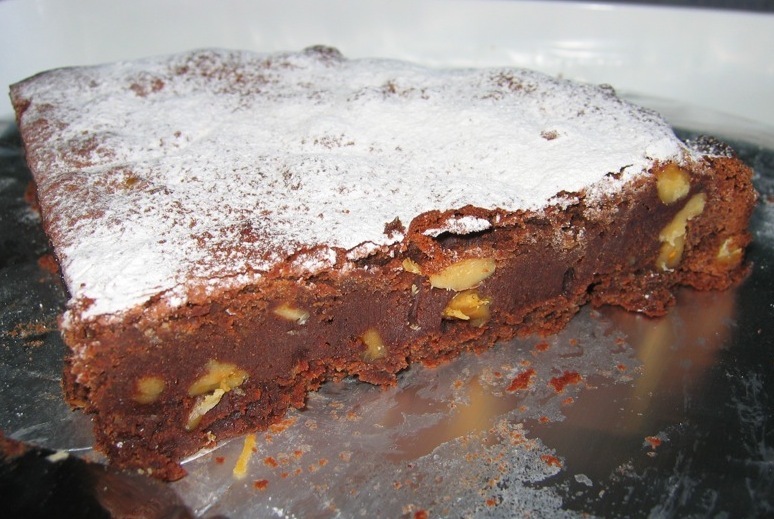 Care is needed to keep the mixture light, so it rises – this is not a dense, gooey brownie! Don’t use fridge cold eggs, these tend to curdle the mixture more easily than room-temperature eggs. I also take the precaution of lightly beating the eggs with a whisk prior to adding. It’s also best to soften the butter so its a good idea to leave the butter out of the fridge as well. Pre-heat the oven, it needs to be hot, and you must put the cakes in to cook straight away, this is not a mix that can be prepared in advance (but the finished cakes will last for a few days if kept in an airtight tin). Once the butter and sugar are light and fluffy, it is time to add the eggs. Add them in bit by bit (e.g. add 2 beaten eggs in at least 3 additions), beat well each time. The mixture will be come quite liquid, but will still be thick and creamy looking. For extra security against curdling the mix, you can add a teaspoon of ground almonds with each addition of egg (up to 3 teaspoons). Adding the flour and any dried ingredients (nuts, cocoa, dried fruit etc.) must be done with care, quickly and without excess mixing. I use the pulse button on the processor – add 1/3 of the flour and press for a single pulse, perhaps 2 then scrape down and add the next 1/3. Add this similarly, and continue to the last addition of flour, scraping down the sides and pulsing once or twice more to ensure the flour and other dry ingredients are mixed – but only just. The mixture should be thick, and reluctantly drop from a spoon – it shouldn’t pour or be too stiff. If it falls, it is too thin and you should add a tablespoon more sieved flour to stiffen it. Or you can add a teaspoon of milk to adjust the mixture to be more fluid. Try out the recipes suggested here first and get used to the consistency of the mixture first, then experiment with your own flavours. Be careful making these additions – don’t over mix the cake now, it will reduce the air incorporates so far. Also be measured in your additions, cakes require careful balance of quantities – you won’t need to adjust these quantities much for different mixtures. When you’re done, quickly spoon the mixture into paper cases – you want to roughly half-fill them, 1 rounded tablespoon is roughly enough. Bake them straight away, in a fairly hot oven (180 deg C in a fan oven) for 12-15 minutes. Don’t take them out too early, or the sponge will not have fixed, and they may sink again. However, after 12 minutes you can safely test the middle of a cake with a skewer – it should come out clean, if not, return for 2-3 minutes and try again. Of course, if you use bigger paper cases, or overfill them, the cakes will take longer to cook. Remove the cakes from the tin straight away and leave to cool completely in their paper cases on a wire rack. You will see some condensation under the cases as you remove them from the tin – if you don’t remove them to cool on a rack, they will sweat and the cases and cakes will get damp and soggy – so don’t forget this step! Now for the variety of flavouring you can add. There are basically three types of flavourings that can be added. Using liquid flavourings such as coffee, vanilla extract etc. demands a little more flour in the recipe to keep the mixture together. Adding dry, powdery ingredients such as cocoa powder, grated chocolate, drinking chocolate or ground nuts requires that the flour content be reduced by the equivalent weight. Chopped nuts, dried fruit etc. are easily added as an extra, without need to adjust the main quantities. So with minimal tweaks the basic mixture can be combined to make any combination of flavours. Add icing for a sweet treat or keep them plain for a healthier snack. Here are two versions of the basic recipe – this one uses added dry cocoa, and thus slightly less flour. 15 g cocoa powder – I’ve been experimenting with using finely grated Venezuelan Black 100% cocoa bar (http://williescacao.com/) but you can use any good cocoa powder. 1. Preheat the oven to 180 deg C (Fan oven). 2. Beat the butter well until smooth, then add the caster sugar and beat until the mixture lightens and gets fluffy (5-10 minutes). 3. Lightly beat the 2 eggs together then add a bit at a time to the mixture, beating well between additions and adding 1 or 2 tsp of ground almonds with the egg (see tip 6 above). 4. Sieve the flour and cocoa together with the salt. Add 1/3 at a time to the mixture and fold in (pulse in 2 or 3 short bursts) until everything is combined. 5. The mixture should drop slowly from a spoon, divide the mixture into the 12 paper cases in a patty tin. 6. Bake in the oven immediately, for 12-15 minutes. Check they are done using a skewer, which should come out clean. Turn out onto a wire rack to cool. Use this basic recipe if you want to add dry flavourings to your cakes, or try this one which uses coffee and vanilla extract as liquids for flavouring, and thus slightly more flour. This one also contains chopped walnuts. 70g chopped walnuts – reserve some for decorating. 1. Follow the directions 1-3 above. 2. Add the coffee and vanilla extracts along with a teaspoon or 2 of ground almonds. Beat together. 3. Sieve the flour with the salt. Add 1/3 at a time to the mixture and fold in (pulse in 2 or 3 short bursts) until everything is combined. 4. Quickly mix in the walnuts using a few pulses. 5. The mixture should drop slowly from a spoon, add another spoon of coffee or vanilla if required to loosen it. 6. Divide the mixture into the 12 paper cases in a patty tin and bake in the oven immediately, for 12-15 minutes. When done, turn out onto a wire rack to cool. Use this basic recipe if you want to add liquid flavourings to your cakes. For a sweet treat, icing the top of the cakes is easy to make. Try these basic quantities and adapt the flavours to suit your cakes. Beat together all the ingredients until light and fluffy. If you use a processor, the mixture may first turn into a large ball, but persistent beating will smooth the mix into a spreadable topping. Add 1-2 tsp of strong made coffee, or milk, to loosen the mixture to an easier spreadable consistency (if required). Decorate with a sprinkle of cocoa powder or icing sugar. Beat all the ingredients together into a soft, fluffy, spreadable icing. Decorate with chopped nuts, flaked almonds or grated chocolate. Melted chocolate – 55g cooking chocolate, broken into chunks, melted then spread on the cakes and left to solidify. Chocolate and hazelnut spread makes a quick and easy topping. Simpler water icing (100 g icing sugar plus a few drops of water at a time added and mixed well – be careful not to make the icing to thin, it will run! You can always add more icing sugar to thicken it again). So, experiment with your favourite flavours in small cake form – and let us know what combinations you like best! Print the basic fairycakes recipe (opens pdf). Posted by cath in easy, mildly spicy, Recipes. Yes its more Thai-style Mexican food with this rustic guacamole. It’s more of a chunky avocado salad than a traditional creamy guacamole, but I really like it. When you’re making salsa, double the quantities of garlic, spring onion, chilli and coriander, juice another lime and do a couple of extra fresh tomatoes, then you can easily make both dips. Scoop out the flesh of 2-3 ripe avocados and roughly chop into smallish cubes. Do this quickly, put it in a bowl and add a splash of lime juice to stop it browning. Add the chopped chilli garlic, spring onions, tomatoes, coriander and a splash more lime juice (reserve some). Press down to make the surface flat, then cover with a thin layer of lime juice. This keeps the guacamole from going brown. Cover with cling film and keep in the fridge until needed. Before serving mix up again and add a garnish of fresh coriander leaves and/or chilli slices. Posted by cath in easy, herbs, ingredients, mildly spicy, Recipes, shopping notes, variations, very spicy. lime juice – 1-2 tbsp (to taste). Combine everything in a bowl. Keeps in the fridge until needed. If you’re pressed for time you can even chop everything roughly and blitz it in a hand blender or similar. I prefer it more rustic, but you can also blend it until it’s smooth if you prefer. * Out of season, you can use tinned tomatoes, although I recommend draining them well first or the salsa will be very runny (use the juice in the chilli con carne, or reserve for pasta sauce, stews etc. – it keeps well in the fridge). For something a little different try a tin of green tomatoes – again drain before use and substitute for the red tomatoes. You can buy green tomatoes in tins from Lupe Pintos in Edinburgh. 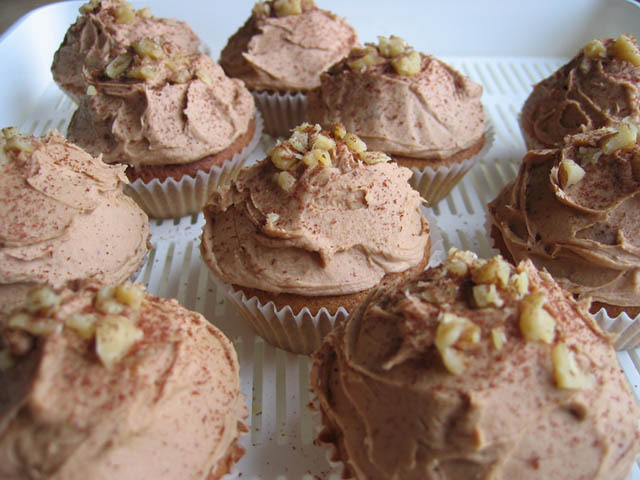 Posted by cath in cakes and treats, comfort food, desserts, easy, Recipes, specials. This is the ultimate in easy, comfort food. A treat with a cup of tea, or a delicious dessert with a scoop of vanilla ice cream, or cream. My brownie recipe has been a long search. I’ve done much researching of many different ideas and recipes. A lot of trials, tests and tweaks later, its a very good thing for my belly (and that of my chief tasters) that the quest is over, and perfection has been reached! 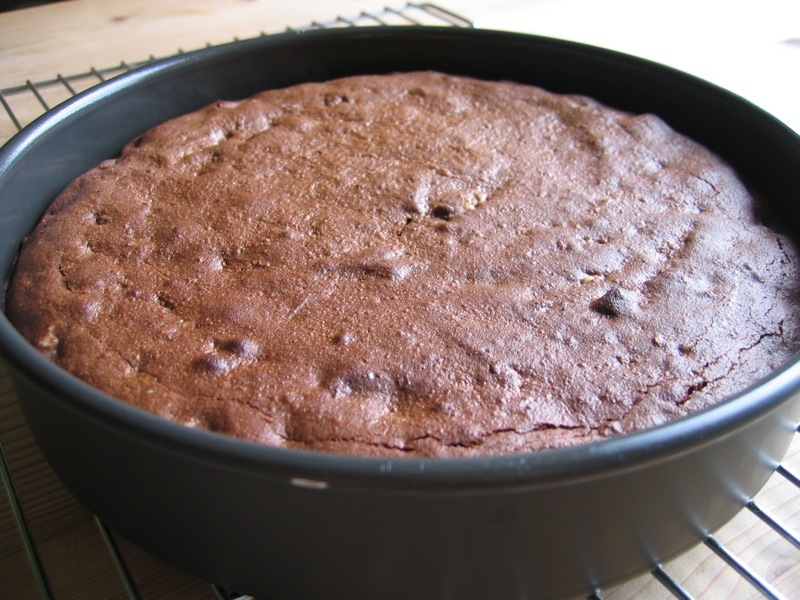 Don’t be tempted to cook the brownie mix as you would a normal cake. Test it with a knife and the middle should still be quite wet. The trick is to also gently press the top of the cake to check that it has firmed up slightly, but still has some give. This should give the crisp top and gooey centre typical of the perfect brownie. Be careful – it may take a few goes to get the timing perfect with an individual cooker – once you’ve got it right, remember to write it down so you know for the next time! This definitely makes the best consistency of brownie. I have tried several combinations of sugars, from caster to muscovado. But it is fine icing sugar which definitely gives the best texture, its thanks to a recipe by Marcus Wareing (author of How to Cook the Perfect...) that I tried it. Remember, a brownie mix is dense and fudgy, unlike cake mix that is typically beaten and aerated. Also, you don’t cook brownies for very long. So there isn’t much mixing or cooking time for the grains of other sugars to dissolve and blend properly. Go for the confectioners sugar! This recipe also adds some golden syrup helps the gooeyness along. Although they are not in all the recipes, I’m sorry, but for me a brownie is not a brownie without some walnuts (or you could use pecans). After trying a recipe by Pierre Hermé, I am also a convert to toasted walnuts. This is a very quick and simple first step and really makes a difference to the flavour, please try it! Also, as I tend to avoid scoffing all my brownies in one go, adding nuts improves the keeping time of cakes and biscuits, so I also add a few spoons of ground almonds with the flour as well to aid moistness. This makes enough to fill one round cake tin (18-20 cm wide). Which gives you at least 10-12 brownie slices, depending on greediness. I know brownies are traditionally square, but I use my favourite loose-bottom cake tin and treat it more like an un-iced cake. Also, this way every slice has some crispy outside and gooey centre – it’s the taste and texture that make these brownies the best! Spread the walnuts on a flat baking sheet and place in the low oven for 10-15 minutes until toasted. Put the timer on, you must not burn them! (When they are ready – they will be lightly browned and mellowed in flavour, just take them out of the oven, pour onto a clean tea cloth, wrap up and bash them against the worktop to slightly crush into smaller pieces, then open up the cloth to let them cool). Whilst the walnuts are cooking, weigh out the rest of the ingredients. Place the chocolate pieces, diced butter and golden syrup together in a medium-large glass bowl. This will be the bowl you mix everything together in, so make sure it’s big enough. Place the bowl over a saucepan of simmering water. (Make sure the bowl does not touch the water, you just need a small amount in the bottom of the pan to provide some steam). Stir occasionally with a large metal spoon to melt and combine. (See my post on chocolate crispy cakes for chocolate melting tips). Whilst the chocolate mixture is melting, sieve together the icing sugar, flour, ground almonds and cocoa powder into another bowl. When the chocolate mixture is nearly smooth and melted, remove from the heat and stir until completely smooth. Then leave to cool whilst you prepare the cake tin. Grease the cake tine and then line the base and sides with baking parchment (if you are using a loose-bottomed tin then just line the bottom). Then grease the lined base and sides carefully with some extra butter. The walnuts should be done by now, once they are out of the oven, turn it up to 180 degC (fan). Break the eggs into a small bowl and beat together with the vanilla extract (if using). Just do this by hand as well, you don’t need to worry about making the mixture airy and light – you want a stodgy mix! When the chocolate mixture has cooled to room temperature (takes at least 5-10 minutes, test it if you are unsure, it can’t be hot as it will scramble the eggs – but don’t wait too long or it will be too stiff to combine with other ingredients) add the beaten eggs and stir vigorously to combine. The mixture will begin to thicken up quite quickly. Then add half of the dry ingredients and mix together vigorously until smooth, continue adding the other half, then the walnuts, beating each time until smooth. The final mixture will be thick, dark and gooey. Pour the mixture into the cake tin. If you like, you can smooth the top a little using a knife – place a metal knife in a cup of hot water until warm, remove and wipe off the water, and use to smooth the top of the mixture. Once the oven is heated up, place the brownies in for 13-15 minutes. To check they are done, the top will be dry looking and slightly cracked – carefully and gently press on the top, which should be beginning to firm but not solid. A knife inserted into the centre should come out moist. Be careful not to overcook the mixture. Leave them to cool in the tin – don’t be tempted to remove them yet! Once cool, carefully remove them from the tin – peeling off the parchment paper. Sieve the top with a little icing sugar. Serve with cream or ice cream for a delicious dessert, or just with a cup of tea or coffee for a decadent snack. Posted by cath in easy, Info and Cooks Notes. I got a great present this Christmas, a germinating jar from bioSnacky®. I’ve been trying out the various mixes of sprouts they sell in Real Foods, like Alfalfa, Mung Beans, Lentils, Radish. So far, it’s worked out well! Alfalfa grows fast and fills the jar completely, the others are growing quite slowly by the relatively cold Kitchen windowsill, but are still tasty and very easy to look after. Get yourself a jar, or similar, and give it a try (all the details are either on the seed packets, or come with the jar). The method goes something like this: Using a tablespoon or so of seeds, rinse them well, then leave to soak for the appropriate time. Rinse and drain, then do this 2 or 3 times daily during the 3-6 days germinating time. It depends on the sprout (or mix) that you choose. 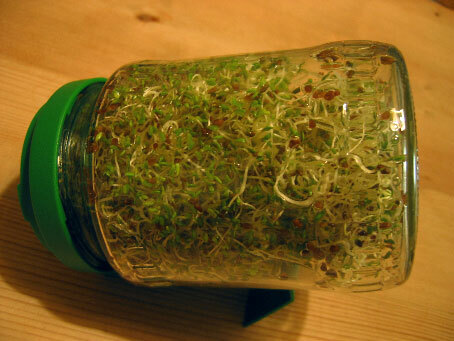 My hope is to be able to grow my own beansprouts for stir frying etc. With a bit more experimenting, practice and hopefully as the weather warms up, I’ll get there…so watch this space! Posted by cath in easy, specials, summer, variations, vegetables. Broad beans are in season at the moment and taste fantastic fresh from the pod. 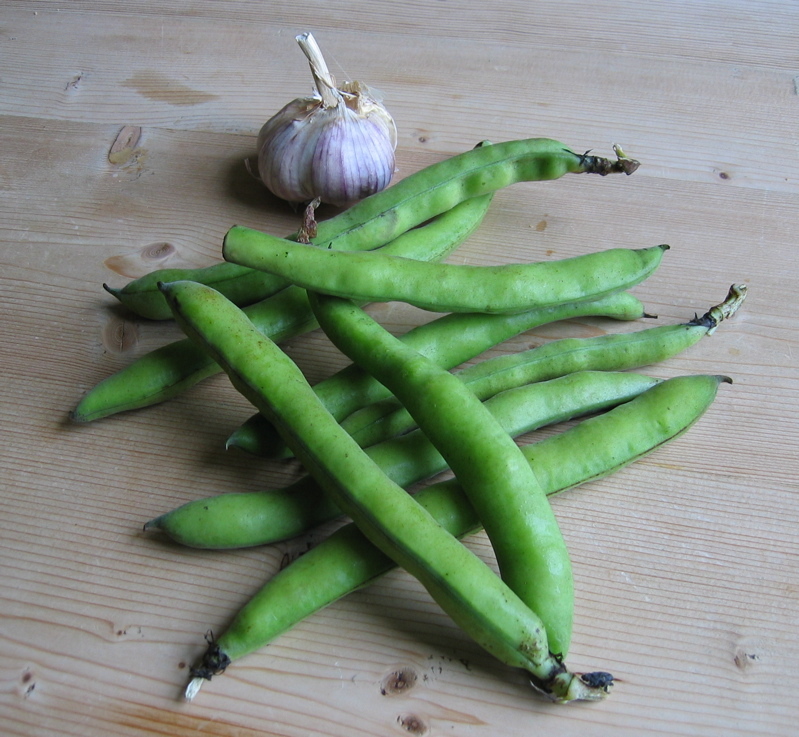 The pods are larger than peas, but basically the same idea – unless they are very young (baby broad beans), you don’t eat the pod (but it does make a lovely stock for vegetarian food). Broad beans go fantastically well with pancetta (plus this might help you get broad beans on the menu for those more fussy about their veg!). Broad beans steam really well, taking about 5-6 minutes, but less if they are very small and young. Just remove them from the pods, rinse and steam. Serve with a knob of butter. 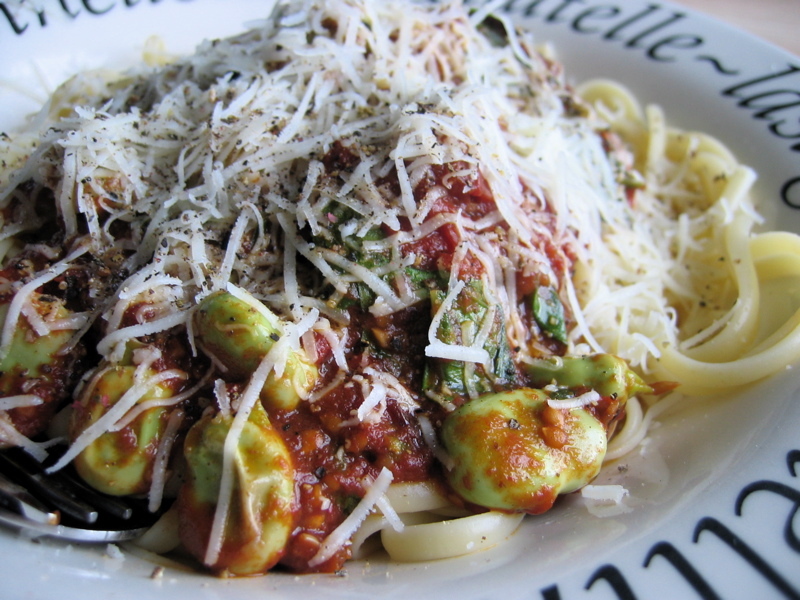 broad beans with tomato sauce. If you’ve got a few large handfuls of broad bean pods you can make a very quick and easy, vegetarian broad bean pod stock. Just cover the beans in water in a large pan, bring to the boil and simmer for 15 minutes. Strain out the pods and reduce the remaining stock. 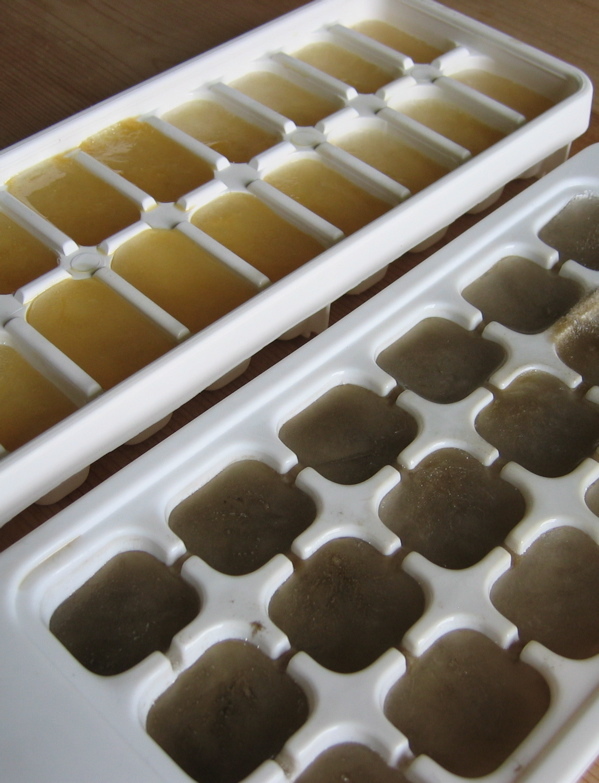 You can reduce it right down to a syrupy liquid and freeze in cubes (or small batches), or just reduce to taste. Stock with a good flavour and consistency will give you a base for making soup or risotto. You can mix pea and broad bean pods together, or do pea-pod stock in the same way. Don’t simmer for longer than 20 minutes – vegetables like these pods release their flavours quickly and can get bitter if overcooked. Posted by cath in easy, summer, vegetables. Using some freshly podded broad beans, and some homemade tomato sauce you can make a vegetarian version of my broad beans with pancetta, tomato and pasta. It’s just as nice, and healthier without the pancetta and pancetta oil. You just need to cook the broad beans gently in the tomato sauce for the last 6-8 minutes of cooking, so once the pasta cooking you can put them in. Thats it! Check the beans are done, then add to the tomato sauce and serve. Couldn’t be easier! 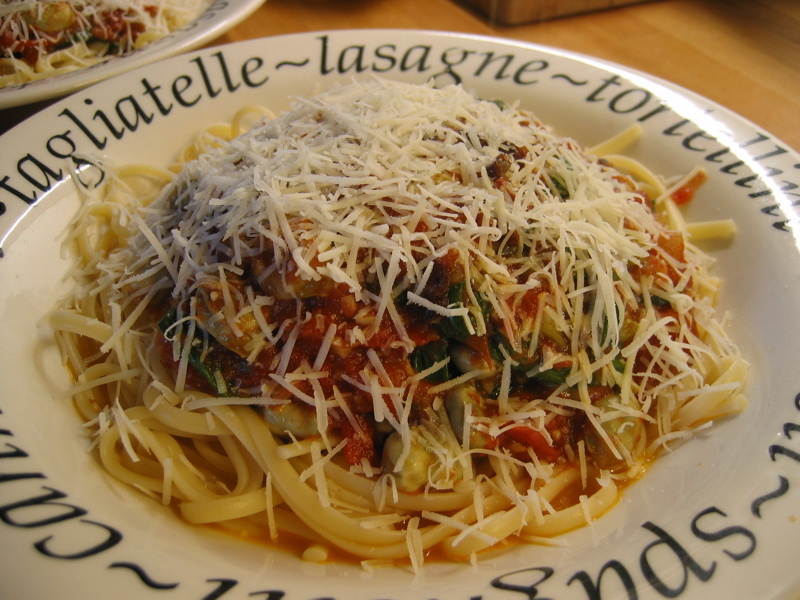 Mix some fresh basil or other herbs into the sauce to vary it. Sprinkle with cheese for a richer dish. Posted by cath in easy, summer, variations, vegetables. For this recipe, take a large handful or two of broad beans, remove them from the pods. Take about 2 inches of pancetta and cut it into slices (which look like Frazzles, those bacon crisps!) and then each slice into short sticks. Find a frying pan which is the right size to fit a lid onto it. Heat the pan up, dry (or use with just a very small splash of oil, rubbed over the pan with some paper towel so that there is the barest coating. This can help the pancetta start to cook and not burn). Now, fry the pancetta on a low heat, melting the fat and gradually crisping up the pancetta pieces. Be careful to agitate them and not to let them burn. Now with the heat turned slightly higher, throw in the broad beans and mix them with the oil. When they start to sizzle, throw in a splash of water (it may spit a bit so be careful!) and quickly cover with the pan lid, after a minute or two, turn the heat down again. Shake the pan a few times during cooking, they will take about 5-10 minutes, depending on their size. Test one to check it is done. It should be soft (but not mushy!). Remove from the heat and drain on a paper towel. This makes a great simple side dish for a meal, or throw the cooked beans with some hot tomato sauce and stir it all into some cooked pasta – yum! Posted by cath in easy, mildly spicy, Recipes, variations, vegetables. Cabbage is easy to get hold of this time of year. 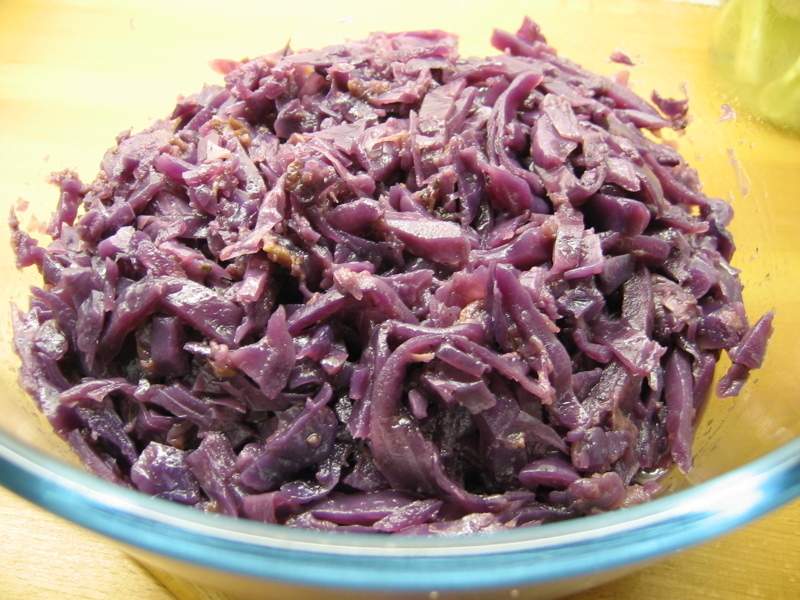 This is a nice way to cook red cabbage. The cooking method can be used with various herbs, spices and flavours in the cooking liquid. It can also be adapted for other cabbages, with different amounts of liquid and length of cooking time. 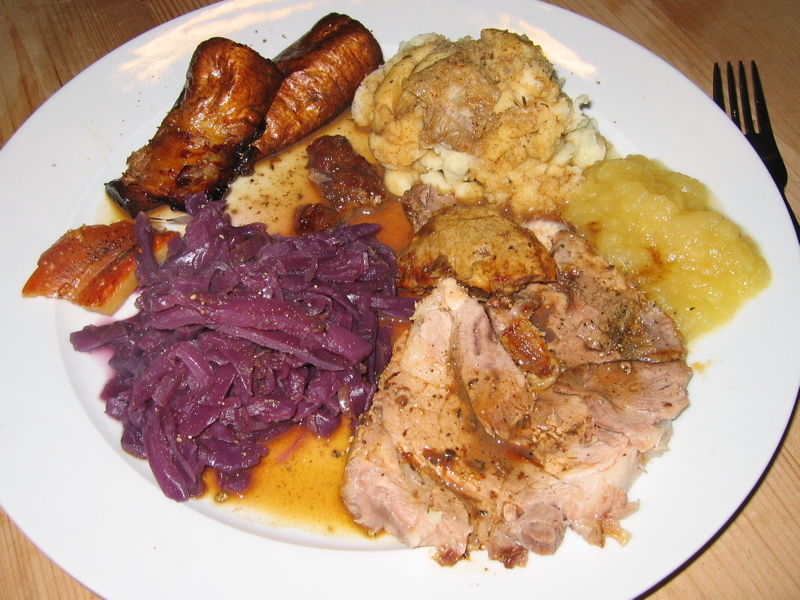 This recipe is for red cabbage with ginger, apple and nutmeg in a port and wine vinegar sweet and sour glaze. It’s all in one pot, and takes up to an hour to cook slowly followed by a quick simmer to reduce any excess liquid to a syrupy sauce. 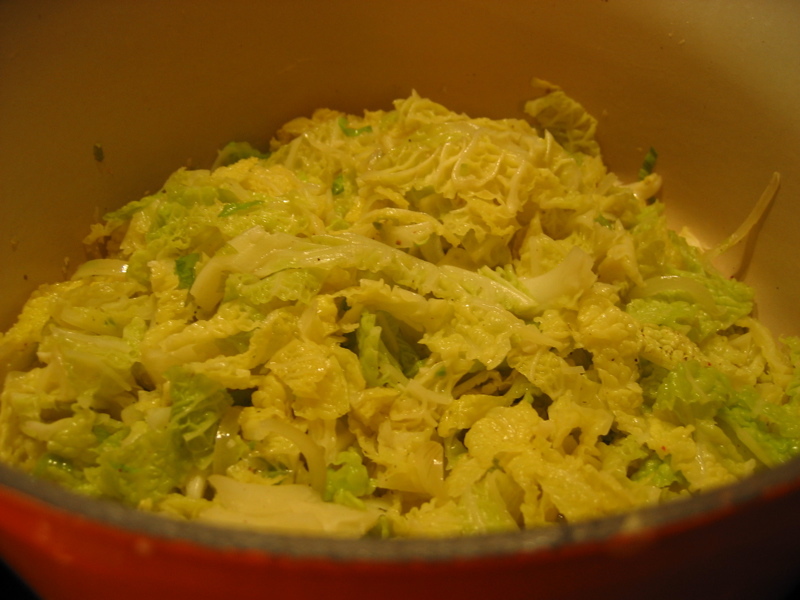 This makes a large quantity (using up a whole cabbage) – but it keeps well in the fridge for 5 days. Reheat batches in the microwave for about 5 minutes or in a small pan on a low-medium heat for 5-10 minutes. Heat some butter and oil (roughly equal proportions) in a very large pan (large enough to fit all the shredded cabbage and other ingredients!) – use just enough so that it covers the bottom of the pan well. Cook the onions on a low-medium heat until they are translucent but not browned, then add the apple and cook for a few minutes, stirring around. Add the ginger, nutmeg. Stir through and cook for a minute more. Rinse the red cabbage in a colander so that it is damp, add half of it straight to the hot pan and stir well. Then add the rest of the cabbage. Don’t worry that the liquid doesn’t cover the cabbage, it only has to provide steam for the cooking process. Any extra liquid you add will have to be reduced at the end of the cooking time, so keep it to a minimum. When you stir the dish occasionally during the cooking time you can add a splash or two of water if the pan is drying up. Season well with pepper and a touch of salt. Cover and simmer on a medium heat for 10 minutes until the cabbage had wilted. Then stir well to combine. Turn down the heat and simmer gently for 30-50 minutes (depending how well done you want the cabbage and how thick you cut it), stirring occasionally. Finally, when the cabbage is cooked remove the lid and turn the heat up to reduce any left over cooking liquor, stirring to coat the cooked cabbage in the thickened glaze. Enjoy cookalicious cabbage! Great with sausages, roast pork, spicy chicken drumsticks…all kinds of things. Try using cinnamon, cloves, even dried chillies to make a fiery, extra spicy cabbage dish. You can use garlic, leeks or more onions instead of ginger too. You can use almost any liquid. If you don’t want a sweet and sour effect using vinegar and sugar, just use more stock, water or wine instead. Cook the onion slowly in oil and butter, then add celery and finally the garlic – do not brown, cook until soft. Add the cabbage, season with salt and pepper and pour in the wine. Cover and cook on medium heat for 5-10 minutes until wilting nicely. Then reduce the heat and cook for up to 20 minutes until the cabbage is soft but not mushy. You may have to remove the lid to reduce any excess liquid in the pan for the last 5-10 minutes.